Both the Cleveland Indians and New York Yankees were to open the 1929 season with uniform numbers on the back of their jerseys. But the April 16 opener at Yankee Stadium was rained out, and so the Indians became the first to play with this style of numbered uniform. After many brief experiments with uniform numbers during the first decades of the century, the 1929 trial finally took hold. By the end of 1932, every big league club wore numbered uniforms, though the Philadelphia Athletics would not wear numbers at home until 1937. 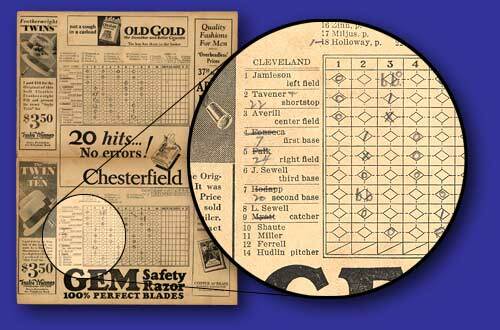 In April of 1929, the Yankees and Indians made history by placing numbers on the back of player shirts. And history was made in October of 1929, when investors lost their shirts as numbers of a different kind, stock values, plummeted. The stock market crash that began in October of 1929 marked the beginning of the Great Depression and the onset of hard times throughout the country.